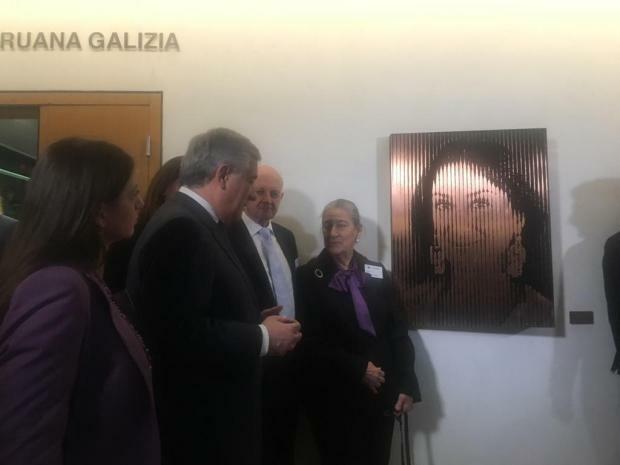 A portrait dedicated to Daphne Caruana Galizia was unveiled at the European Parliament on Tuesday to mark one year since the assassination of the journalist. The work by Danish-born artist and Malta resident Marie Louise Kold was unveiled in Strasbourg, in the presence of European President Antonio Tajani and Ms Caruana Galizia's family members. The portrait, which took 470 hours in total to create, was made of etched and polished copper, bronze and brass. "The etched areas were filled in with printer's ink from the printing press used to publish some of Daphne's work," Ms Kold said. Different elements of Ms Caruana Galiza's life, such as the bay leaves in her garden, book titles, and Article 11 from the EU charter of Fundamental rights are etched on the side of the asymmetrical frame of the portrait. "We called for an international investigation and we did not achieve the outcomes we were hoping for," Mr Tajani said. The European Parliament has repeatedly called for an independent inquiry into the murder of Ms Caruana Galizia. The Prime Minister said there was no need for an investigation since the family approved of the current inquiring magistrate. "Daphne was a frontline soldier and we need to find out who commissioned her murder," Mr Tajani said. The European Parliament will start awarding a prize for investigative journalism named after Ms Caruana Galizia every year, starting next year, he announced. The family of the assassinated journalist thanked Ms Kold, with Peter Caruana Galizia saying a part of her will still continue living in the room in Strasbourg. Caruana Galizia's family with Antonio Tajani.